As I’ve mentioned before, this farm mama has a day job, which occasionally calls for me to be out of town. But thanks to Cowboy and family, someone is always at the farm to care for the cast of characters that call Wild Horse Valley Home. Admittedly, the number of critters we have is due to me, and my inability to say “no” to a creature in need. And while Cowboy is an animal lover too, sometimes they just flat wear him out. Honestly, this last couple of weeks I think they have been conspiring against me to demonstrate just how much work they are. On my recent work trip, I got a text from Cowboy that Sweetie Pie the donkey was limping. As I prepared to speak at a media conference, I was guessing I was the only one getting texts about injured donkeys. Sometimes I feel like a girl with two personalities, high-tech product manager and poop-scooping farm girl. 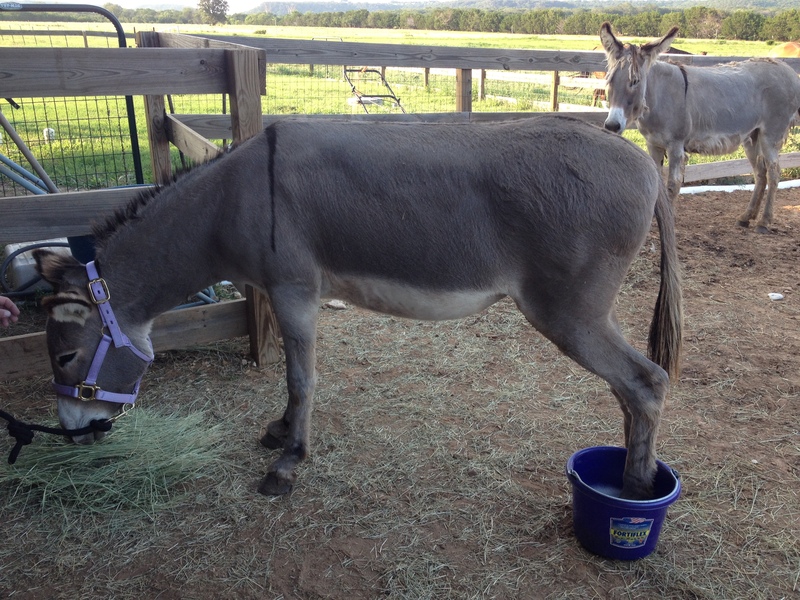 This is from earlier in the summer when Sweetie Pie hurt her back hoof. This time she was not willing to soak it like a good donkey. We tried, and we had flying buckets to prove it. After calls to the vet and farrier, we decided it was likely an abscess and scheduled the farrier to come as soon as he could make it out to us. Cowboy was on donkey duty and kept me apprised daily of how our little Pie was getting along. She was limping pitifully on her front left leg. However, Cowboy noticed something odd. If Sweetie Pie did not see him looking at her, she moved much better. The moment he would turn and look at her, the limping would ensue with pomp and circumstance, as though her front leg was absolutely useless. Was our little donkey playing on Cowboy’s sympathies? Are they that smart? You bet your bottom dollar they are! Finally the farrier arrived and found that Sweetie Pie had indeed injured her little hoof with a puncture wound, likely from some type of thorn she found out in the pasture. The farrier made quick work of it and opened the wound so it could drain and give her relief. However, while he said it was likely uncomfortable, he thought our little Pie was a bit of a “drama queen.” Really? You don’t say! Just like two-legged kiddos, the four-leggeds know how to get attention with the best of them. The good news is that Sweetie Pie is on the mend, that is as long as we don’t look at her.